onArcade 2 has much cleaner and better code. You might not notice it if you won't be modifying the code, but your server will surely thank you for upgrading to onArcade 2. Template system has changed a lot. New template system allows using multiple templates at the same time and registered members can change their template. You can also edit template files through admin panel. Translating onArcade 2 is easy thanks to new language system, no need to go through all files and find text that needs editing, everything can be done through couple of language files. This also enables you to use multiple languages on your arcade website. AJAX isn't just soccer team in Amsterdam, it is also something that can save you some server resources and your visitors some time. In onArcade 2 several functions are now AJAX based. Since onArcade 2 gives much more options to arcade visitors, then old profile editing page just isn't enough anymore. That is why onArcade now has User CP. In User CP members can edit their profile information, select site template and language, change their password and email address, and edit avatar. onArcade 2 also allows using avatar galleries. Many people seem to like RSS Feeds, so I have also decided to add this feature to onArcade 2. onArcade 2 has feed of most popular files, newest files, and news. onArcade has several improvements in security department. Most of them you will never notice, unless you are trying to crack into your own arcade, but probably the most noticeable is image verification that will help you get rid of bot registrations and spam. onArcade 2 has so many new features that old admin panel just could not handle it all, so that is why I have created new admin panel. Finding the latest and the greatest games has always been one of the most difficult part about running an arcade, onArcade 2 solves this problem. All onArcade 2 users have access to game feed where you can download new games to your arcade. Game feed is rather small at the moment, but I am planning to grow it a lot bigger, also I am soon going to open website where all game creators can submit new games to game feed. If you have been using onArcade 2 beta then you have probably noticed small question marks on all admin panel pages, these links didn't do much before, but after upgrading to onArcade 2 final you can access onArcade 2 Help Database by clicking on them. 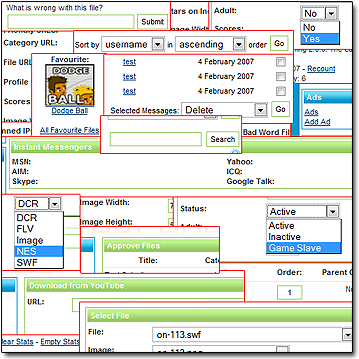 At the moment Help Database has only the most basic information and video tutorial on how to download videos from YouTube to your site, but over time I will be adding more information and tutorials. I know you have all been waiting for it and now it is finally here - scores systems. This will make playing on your site much more interesting, because members can now compete against each other on games that support scores. 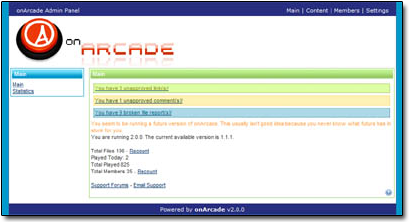 onArcade scores system works with phpBB-Amod and IBPro games, I am also going to release onArcade own format some time in the future. + Many... Many... MANY more smaller and bigger changes. In order to secure the future development of onArcade I have decided to modify the pricing structure a bit. This means that if you have onArcade 2 license, then you will get free upgrades in onArcade 2 series (2.x.x) and support for as long as onArcade 2 is supported (untill few months after the release of onArcade 3), after the release of onArcade 3 you can chose between paying upgrading fee (around 25-50% of the full price, final price will be decided upon the release of new version) and getting onArcade 3 or staying with onArcade 2. Also one more thing this is going to change is that as of now on you are allowed to change the domain of your license within 1 year after the purchase of your license (you weren't allowed to change your domain before). In order to do this you first have to remove the script from old domain, then you send email with license key, old domain and new domain to support [ät] onarcade.com requesting for domain change and if everything is OK, then I will change your domain within 48 hours. I am already planning features for onArcade 2.1, I will also soon open thread for suggestions, but I'll let you play around with onArcade 2 for few days before I do that. onArcade 2.1 should come out late 2007, I have also planned to release few more versions in onArcade 2 series during 2008, onArcade 3 is planned into 2009, but it is possible that it might come out even later, at the moment I am concentrating on developing onArcade 2. Back up all files and database before upgrading. Then overwrite all files except includes/dbinfo.php and includes/settings.php with onArcade 2 files. Now go to yoursite.com/install/upgrade.php, select 1.0 as version number, check if license and database information is correct, and click upgrade. Back up all files and database before upgrading. Then overwrite all files except includes/dbinfo.php and includes/settings.php with onArcade 2 files. Now go to yoursite.com/install/upgrade.php, select 1.1 as version number, check if license and database information is correct, and click upgrade. Overwrite all files except includes/dbinfo.php and includes/settings.php with onArcade 2 files. Apply the bug fixes in this thread http://www.onarcade.com/forums/showthread.php?tid=405. You may also overwrite encoded files with non-encoded ones if you wish, but that is not necessary. If you have any questions regarding onArcade 2 then let me know! Will our games still be there after update? Is this completely unencoded Hans? How to use score mode. What i have to do to remove the copyright info in this version. bojeunx Wrote: Will our games still be there after update? Ram85 Wrote: Is this completely unencoded Hans? Basically yes, I have still decided to encode installation script, but that doesn't affect your site any way after you have successfully installed the script. You upload games that support scores and on adding page you switch scores on. There should also be one game in game feed that supports scores, so you can test it out with that. 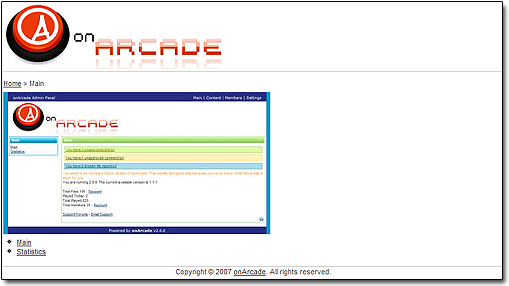 Powered by onArcade line is located in template files, templates/onarcade/main.template.php to be exact. You can also do that through admin panel, on settings pages you will find template editor. Which files was it that were encoded in the onArcade 2 Beta 3? Nachen Wrote: Which files was it that were encoded in the onArcade 2 Beta 3? That is because onArcade 2 now uses unix timestamp for dates and I didn't take that into account when creating the upgrading script. I can help you set them all to todays date, or I am also planning to release improved upgrading script some time in the future, so if you have backup of your onArcade 1.1.1 site, then you could go back to onArcade 1 and upgrade when I have released better upgrading script. I am sorry about that, there are so many differences between onArcade 1 and onArcade 2 that I totally forgot about the difference of time formats when I created upgrading script.